Nylon Radio Case for Harris 7100 Radio models for standard OEM battery. 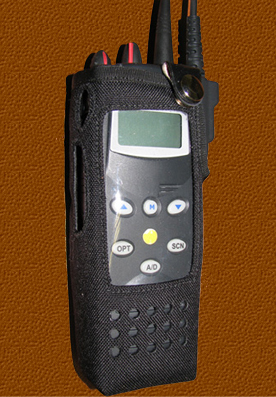 Dura-Pouch padded nylon case for M/A-COM 7100P radio. The clear vinyl window protects the keys from moisture and dirt while providing full access. The material is 600 Denier black nylon with ribbon edge binding for extra wear since this is the area that usually fails first. The cutout for PTT and Monitor buttons are fully stitched to seal them from wear also. The standard belt attachment is a sewn-on belt loop.